Concrete used to be considered a cold, lifeless material. 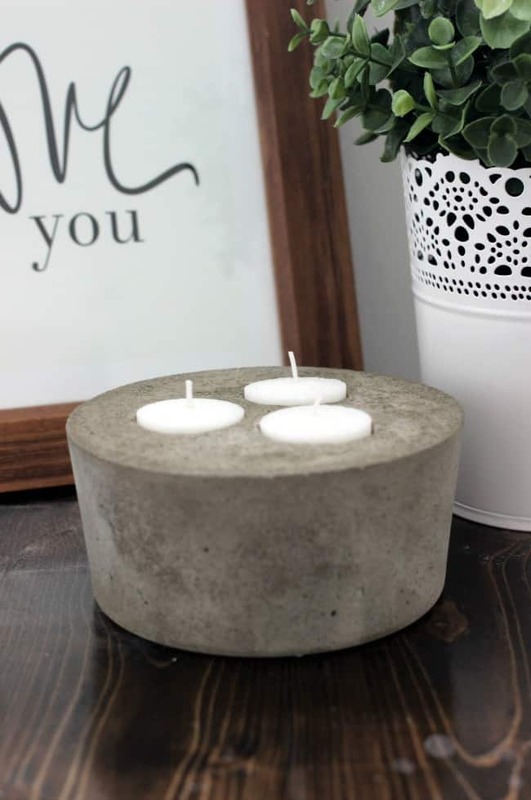 We didn’t see a lot of concrete products in home decor, but recently we are seeing it pop up again. 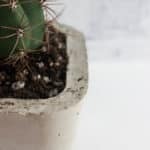 My industrial-loving side really loves using raw materials and concrete is definitely one of them! 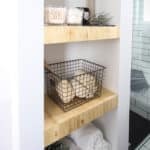 When we renovated our Modern Master Bathroom, I really wanted the space to have a few industrial touches, and these concrete soap dishes were one of the ways I incorporated that idea. 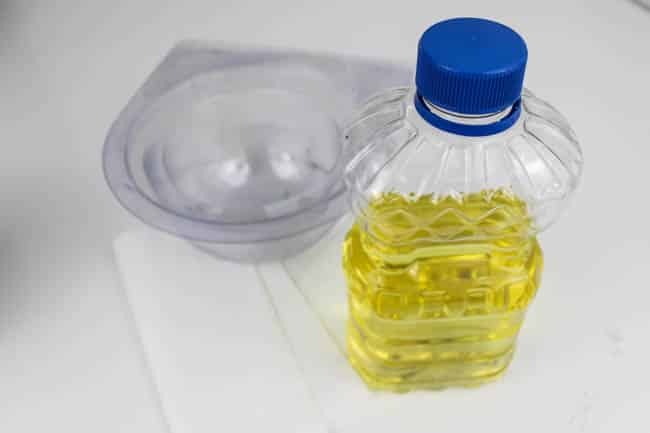 Start by coating the mold in vegetable oil. This will prevent the concrete piece from sticking to the plastic mold. 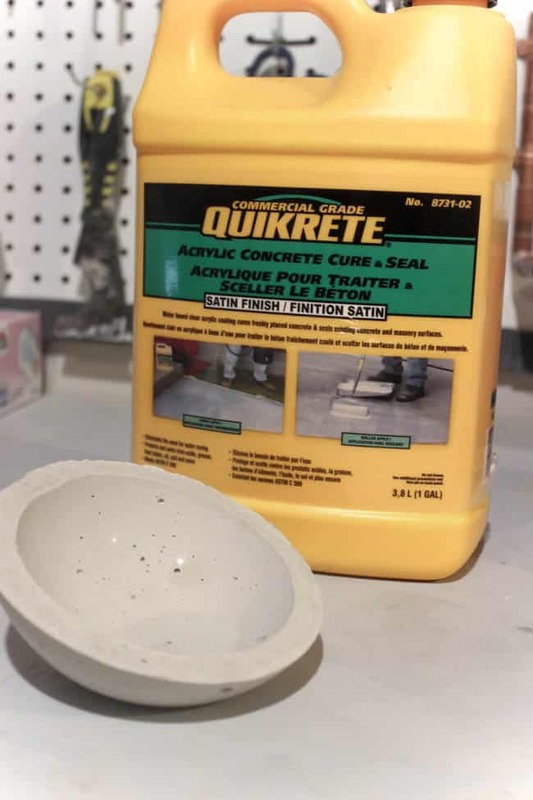 Next, mix your concrete according to the directions on the package. 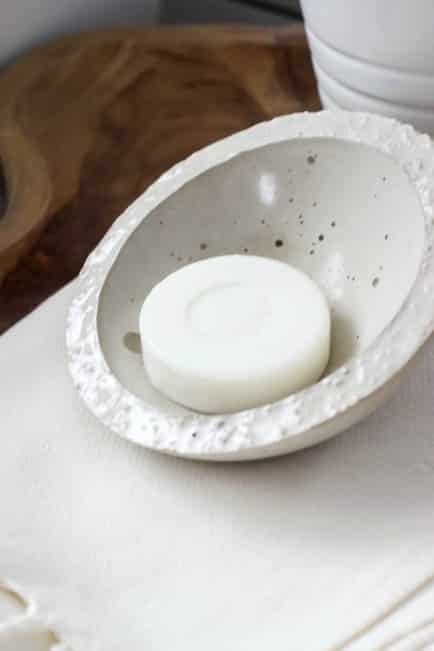 I wanted the soap dish to be shallow on one side, and tall on the back side, so I poured the concrete mix into the mold, and then tipped the mold on its side. The flat part of the mold was now to the side, instead of directly underneath. Tap the mold on the table a few times to get any air bubbles out, and then let the dish set (about an hour). The dish should come out of the mold easily. 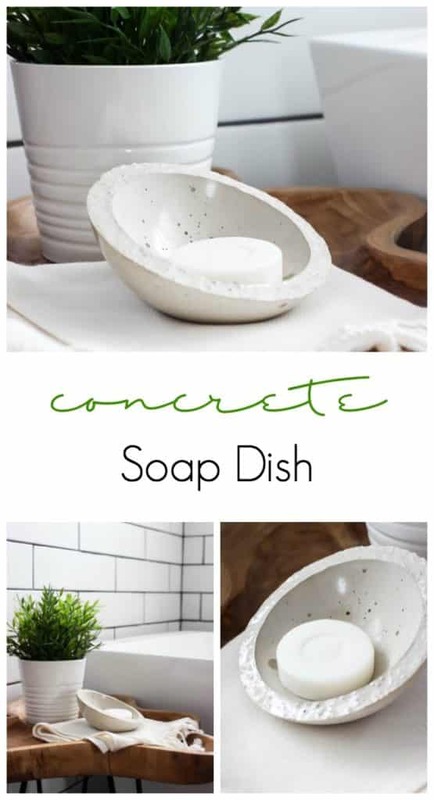 Then you can use your concrete sealer to waterproof the soap dish. I did a couple of coats to make sure that I got into all of the cracks and protected the piece well. This project can be started and finished in an afternoon. It was the perfect addition to our bathroom! 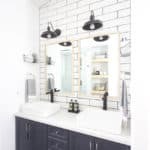 And don’t forget to take a look at our Modern Bathroom Renovation! Love your ideas, thanks so much for sharing. Husband can do soap dish for sure. 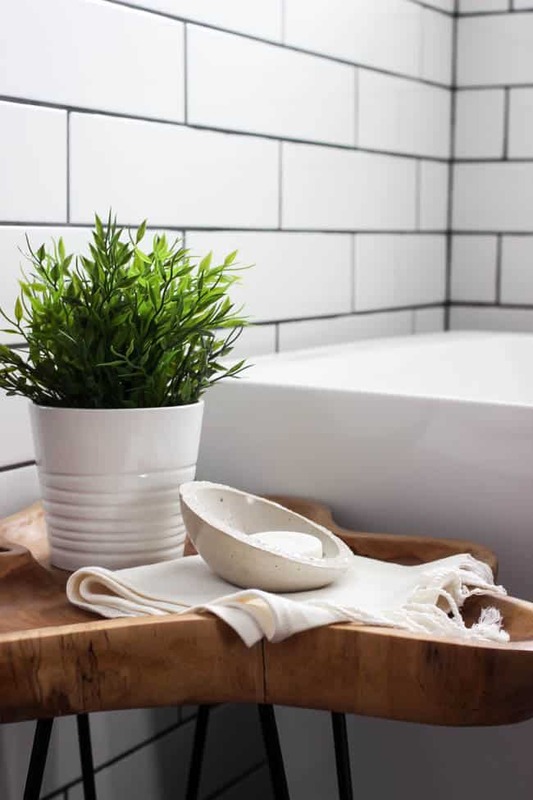 I love the soap dish ! it seems really easy n waay cool ! but the thing I adore is the table its sitten on. now, being its that cool, I know I cant b the only one inquiring about it. am I ? its soo beautiful…. a piece of wood n iron. who woulda thought ? Oh I’ve been really wanting to try this! Now I definitely need too! It turned out great!! Thank you! It was such a fun project!! Wow, I love this! I was scrolling through our links for the Creative Circle Link Party and this stood out to me. I love the simplicity. 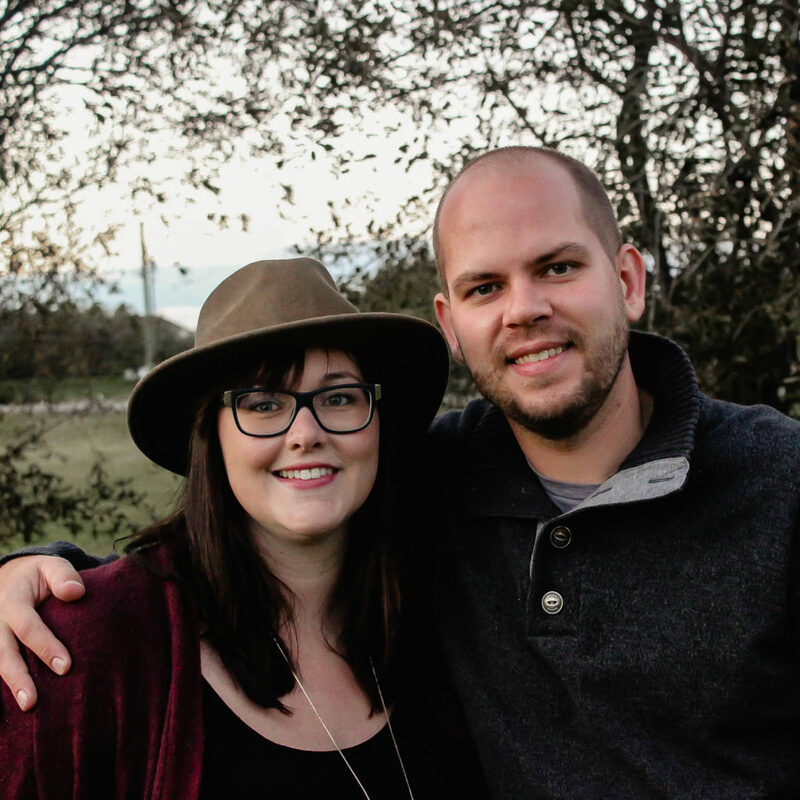 Beautiful job, Lindi! 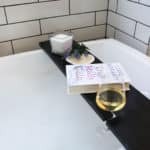 What a great idea – it looks fab! 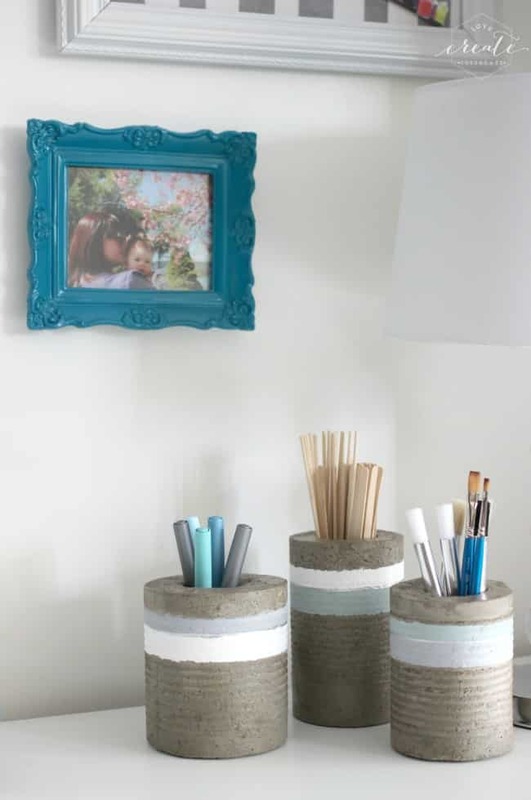 I want to have a go at something like this, all things concrete is so in here int he Netherlands at the moment. Thank you!! I hope you do try! Send me a picture if you do – I’d love to see! 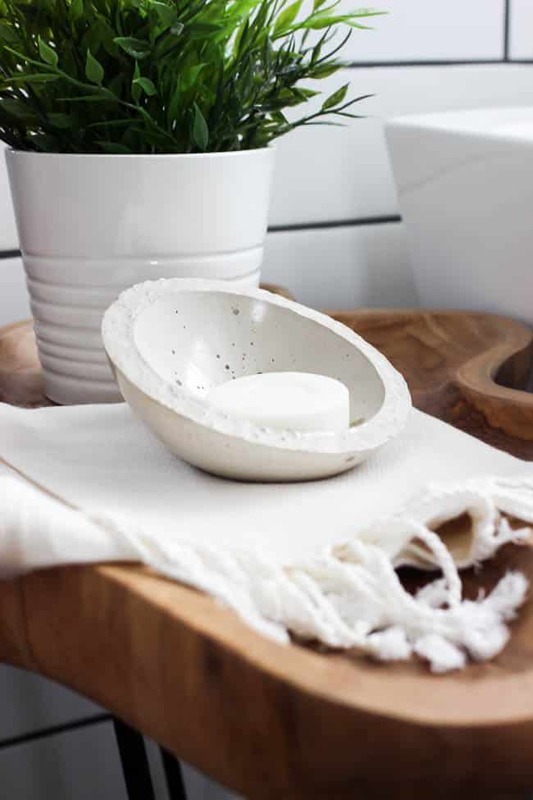 I love your ceramic soap dish, it looks beautiful. Just got all the supplies in the mail and ready to try. 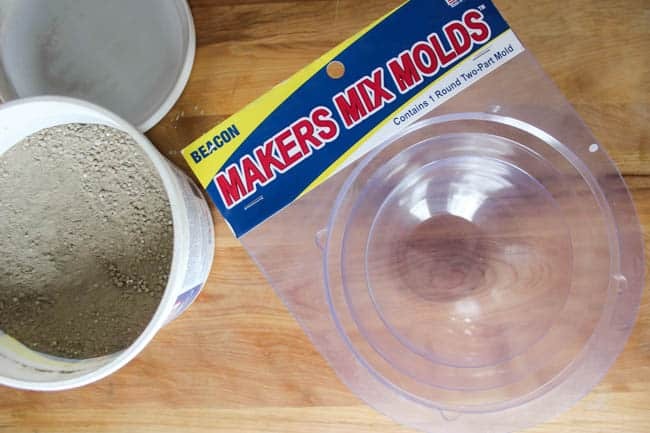 I read the directions on the Maker’s Mix but not sure how big a batch of mix to make? 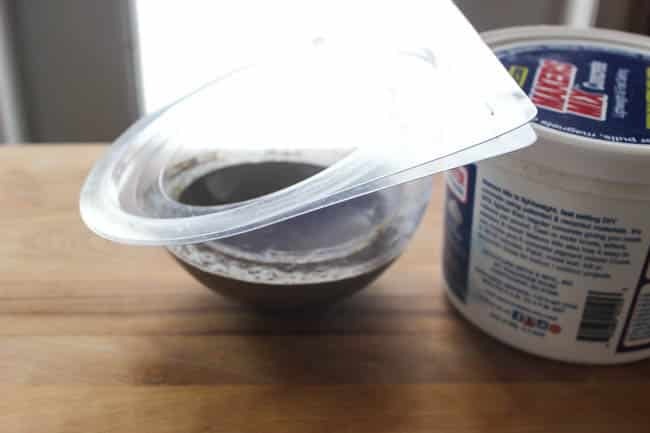 Did you use 1 or 2 cups or more of the Makers Mix? Thank you for sharing your creations! Love this! I love doing cement projects! 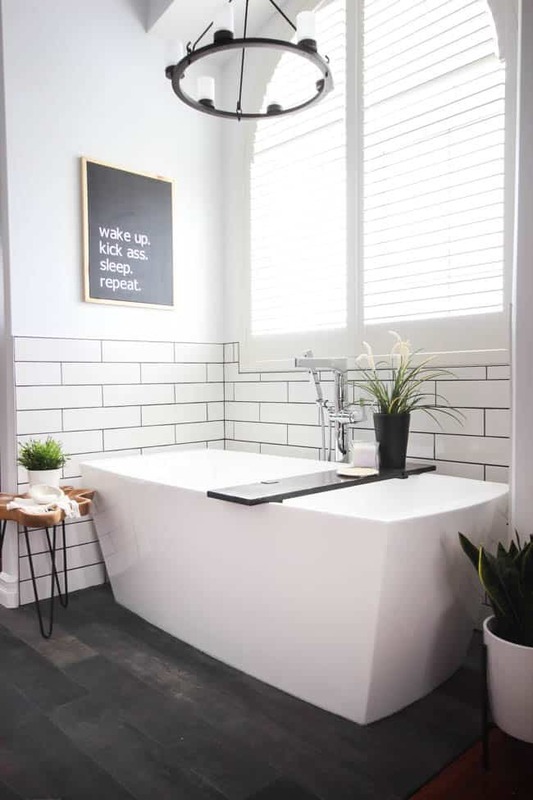 It took me awhile to like the look but now I love the look of concrete floors, planters and kitchen countertops. This is genius! 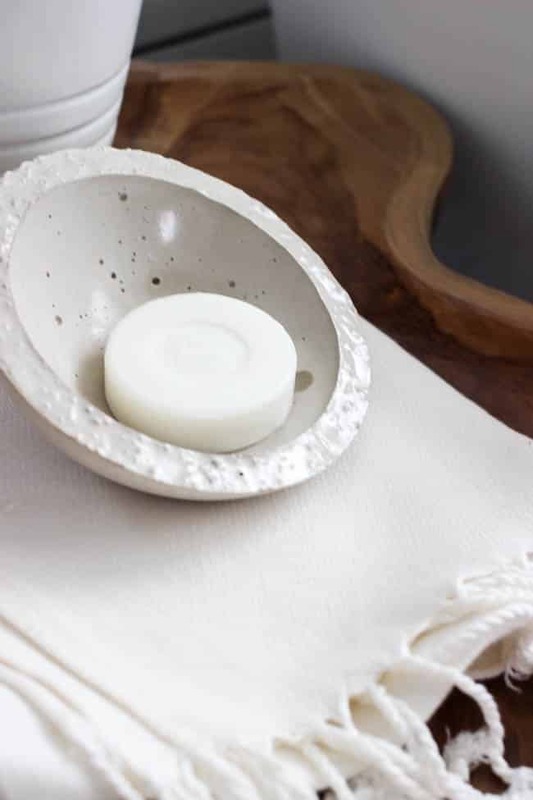 Your soap dish looks elegant. I want to try it too. Thanks for sharing this bright idea. Cheers! 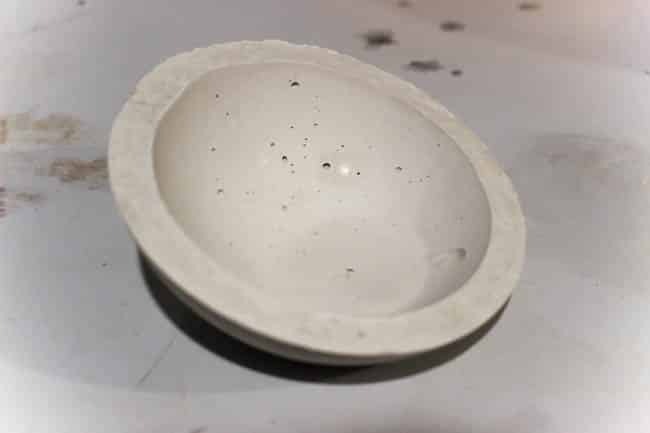 I just made the soap dish, but mine is darker than yours. Will the sealer lighten it up? Glad you made it! No, the seal wouldn’t lighten it, it would just add a gloss finish. 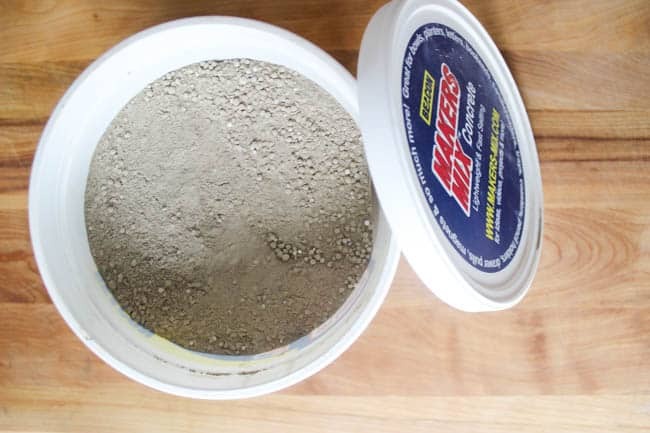 You may have just had a slightly different colour in your concrete mix. This looks so cool, I am just wondering how is the durability? 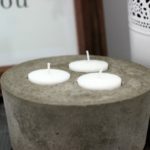 I have tried a few DIY with concrete but after a while it starts to crack.